In case you’re wondering how to emboss resist, here’s a tutorial for you to get started. 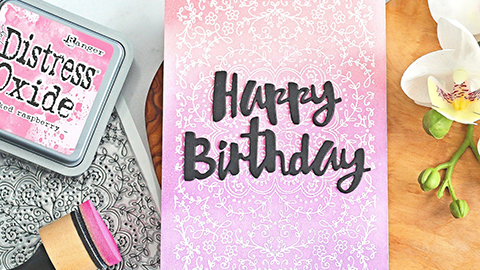 Emboss Resist is a wonderful stamping technique for you to have in your crafty toolkit of ideas! It’s a way to give your stamps a whole new life and also a way to create interesting and colourful backgrounds. The technique involves heat embossing with white embossing powder on white cardstock. Once your heat embossing is complete, you add colour on top of your embossing (either with watercolours, Distress Oxides, or Distress Inks) to create a resist effect. The embossing will “resist” the colour you add and leave you with a bright white stamped image surrounded by gorgeous colour! 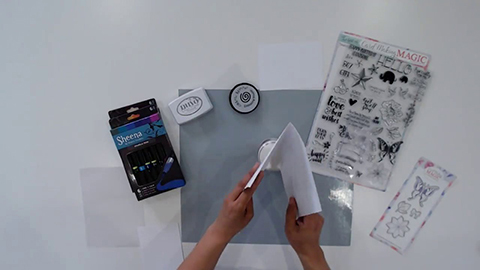 Step 2: Sprinkle white embossing powder on your image and shake off the excess powder for later use. Step 3: Melt your embossing powder with a heat tool. Step 4: Let the embossing cool. Step 5: Take an ink blending tool and your medium of choice (watercolours, Distress Oxides, Distress Inks, coloured stamp pads, etc.) and blend the colour across the cardstock. You don’t have to be careful about ruining your embossing. Sweep your colours directly on it. The colours will resist the white embossing and leave you with a crisp, white stamped image. I hope you’re able to add this technique to your crafty toolbox of ideas and come back to it again and again! It’s really simple and the effects are so bright and beautiful! Happy crafting!